All-inorganic cesium lead halide perovskite quantum dots (QDs) have been a promising candidate for optoelectronic devices in recent years, such as light-emitting diodes, photodetectors and solar cells, owing to their superb optoelectronic properties. 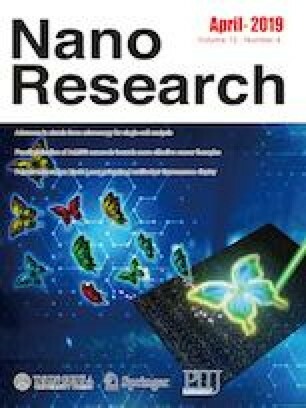 Still, the stability issue of nanocrystals is a bottleneck for their practical application. Herein, we report a facile method for the synthesis of a series of phosphine ligand modified CsPbBr3 QDs with high PL intensity. By introducing organic phosphine ligands, the tolerance of CsPbBr3 QDs to ethanol, water and UV light was dramatically improved. Moreover, the phosphine ligand modified QD films deposited on the glass subtracts exhibit superior PL intensity and optical stability to those of pristine QD based films. Supplementary material (supporting figures) is available in the online version of this article at https://doi.org/10.1007/s12274-019-2289-8. This research is supported by National Natural Science Foundation of China (No. 21771063), the State Key Research Development Program of China (No. 2016YFA0204200), and the Fundamental Research Funds for the Central Universities in China (Nos. WJ1714046 and 222201717003). This article is dedicated to Professor Jin-shun Huang on the occasion of his 80th birthday.